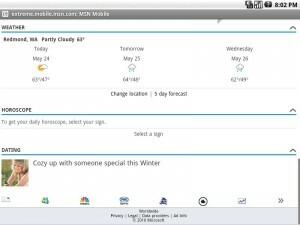 I don’t know how many of you have used the Android operating system by Google, but I came across this web site that has a Live CD version that you can run on your computer. 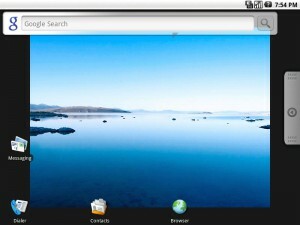 I is really meant to allow developers to test and build new applications for the Droid OS. Well I thought it was pretty cool and I downloaded it and played around for a little while. I ran it as a virtual machine using VMWare and then I also loaded it up on a Dell workstation. I think it worked best in the virtual, on the Dell it keep going to sleep mode. It may be part of the battery warning you get when you first load Android. However it was cool to play around with, I even got on to the internet with it. The mouse is used to simulate the touch screen by holding down the right button and basically dragging the screen. 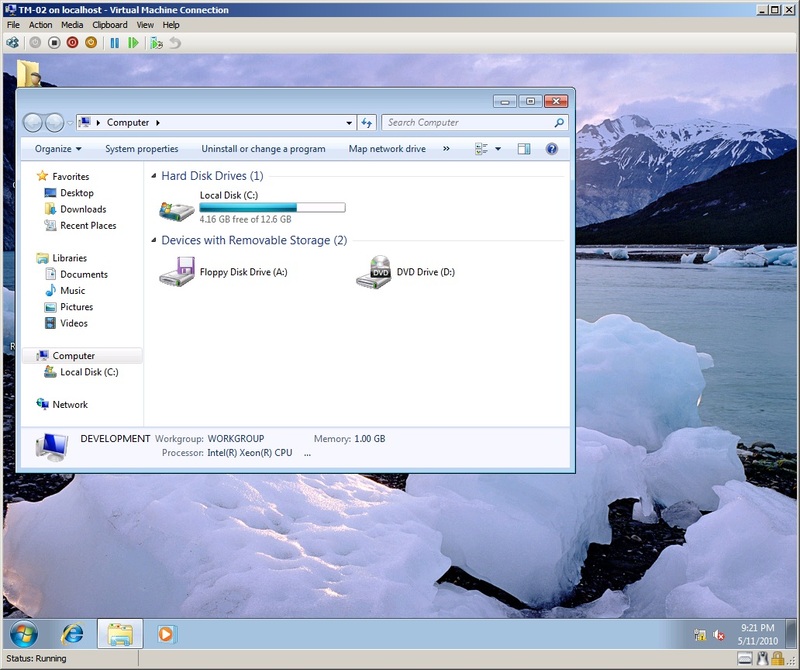 Here are some screen shots of the virtual machine I was using. 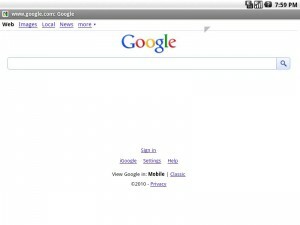 Now I wouldn’t say that you can go out and replace you current operating system with Android. But I think it is a pretty cool way to get a glimpse of Android before you buy a smart phone, use it to develop applications, or just to play around with the OS. 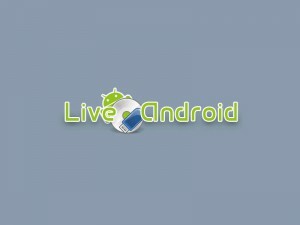 Anyhow check it out at http://code.google.com/p/live-android/ . You download it in two parts and use hjsplit to rejoin the ISO file. Fedora is my favorite flavor of Linux and I use it as a Desktop OS and as a Server. I just thought I would throw this out there for others to check out. 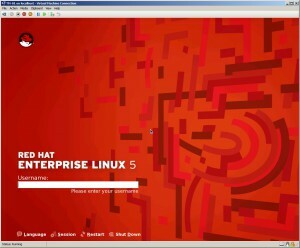 Fedora for thoughs who didn’t know is an Red Hat based distro. I have made attempts to convert completely over to open source software, but there are just somethings that require Windows. Either way it is a good operating system and you should take a look at it. You can find out more at www.fedoraproject.org .Here is a list of features have been accepted by the Fedora Engineering Steering Committee for the Fedora 13 Release. Well to get all of this started I had not covered any thing on Hyper V so I decided to dig in and see what I come up with. First off Hyper V has been around for a while, ever since Windows Server 2008 came about. It really is the next stage in Microsoft’s Virtualization program which as we all know started with Virtual PC and Virtual Server 2005. It seems to be a good hypervisor but lacks some of the features and compatibility you see in other hypervisors. 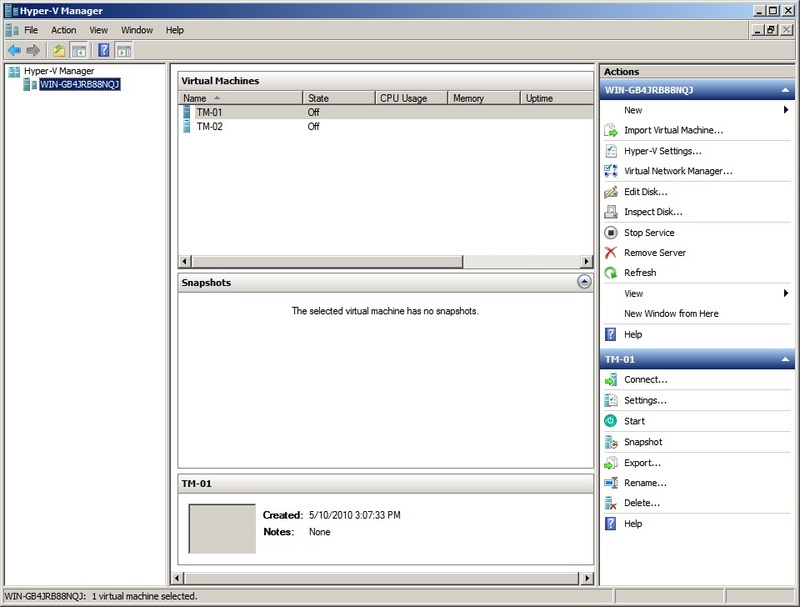 Hyper V can be run two ways, as a standalone server or as a role on a Windows 2008 Server. 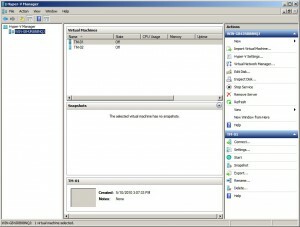 So lets get started with the features of Hyper V.
Processor Compatibility Mode for live migration– allows live migration across different CPU versions within the same processor family, (e.g.”Intel Core 2-to-Intel Pentium 4” or “AMD Opteron-to-AMD Athlon”) enabling migration across a broader range of Hyper-V host hardware. I think it is important to mention that Windows Server 2008 with Hyper V has built in management capabilities were as Hyper V Server 2008 requires the purchase of Microsoft’s System Center Virtual Machine Manager, some third part management software if it is available, or use the Hyper V manager that is part of Windows Server with Hyper V. Here is a diagram of how Hyper V is suppose to work. Now there are some compatibility issues with Hyper V in the fact that it does not support vary many operating systems as clients. Of course it supports modern day Windows operating systems, but it only supports 2 versions of Linux in Red Hat and SUSE. I’m not saying you can’t get others to work in Hyper V just that these are the Microsoft supported operating systems. It’s a pretty small list compared to Vmware or Xen Server. Here is a complete list. Hyper V as a role on a Windows 2008 server has the feel of a add on hypervisor like Virtualbox, Vmware Workstation, or even Virtual PC. You install it like any other Windows role and simple open the Hyper V manager and get started creating virtual machine. It has what seems like a standard virtual machine window with start, stop, and reset buttons. 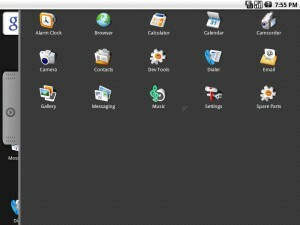 The interface has nothing that I found to be different or innovative, it seem to be just a copy of several other virtualization software’s interfaces. 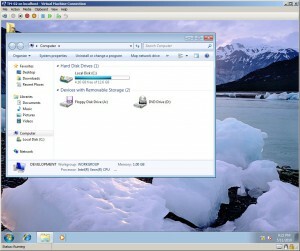 Here are some screen shots of Hyper V on a 2008 R2 server. I’m not sure how effective it will be to run more than maybe one or two virtual with Hyper V on a Windows 2008 server. I would think that these virtuals would still have to compete with the Windows server for resources, making the server less likely to perform as well as a standalone virtual server like ESX or Xen Server. However with Hyper V Server 2008 R2 you should be able to eliminate the draw the resource usage of a host operating system. Hyper V server looked a whole lot like the Windows 2008 Server Core to me. 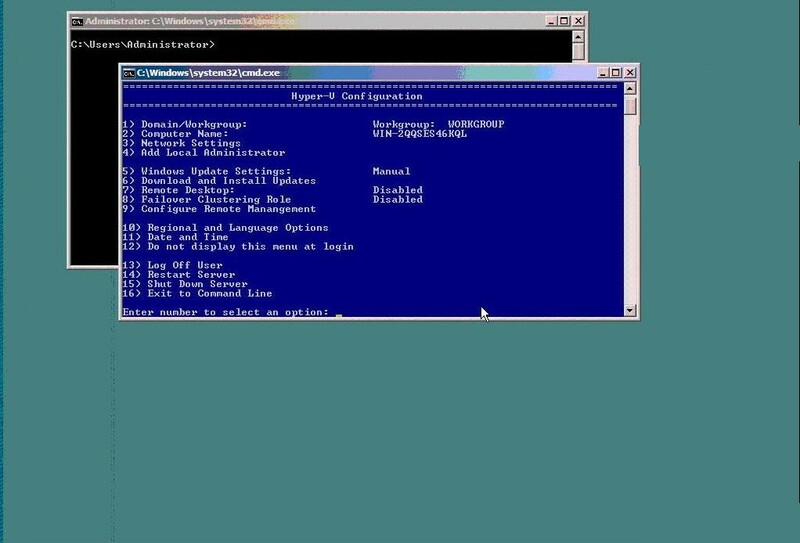 After installation it opened a command prompt and a script that allowed you to perform really basic functions such as setting time or changing the name of the server. Then after a little more research I found that you need a add on management system that isn’t included with Hyper V server. Now there could be some other third party software out there that can manage a Hyper V server I am just unaware of it at this point, but Microsoft requires you to purchase SCVMM (System Center Virtual Machine Manager) to make use of the standalone virtual server or to have another Windows 2008 Server that has Hyper V installed to operate the standalone Hyper V server. I have not been really able to test the Hyper V Server but I it seems to be a Windows Server based hypervisor. It may perform really well but I am not sure if it can out perform the Linux based Virtual servers in ESX and Xen Server. For thoughs that didn’t know they are based on a modified Red Hat Linux or at least that is what it looks like to me. Plus the list of supported operating systems pretty much is every operating system that is made compared to the predominantly Windows client list for Hyper V.
The big question I keep seeing in my research is whether a Windows based Hyperviser can be as reliable as an ESX server. Everything I see talks about Windows and its reliability, and I found in an article that quotes from the Hyper V release notes. The statement afterward was you simply reboot Hyper V to fix the problem, Would you choose this platform to virtualize hundreds of servers, if it has this statement in the release notes as a known issue? In terms of reliability and uptime, it has been stated that ESX will run for 1000+ days without a reboot, whereas Windows Server 2008 Hyper-V will need to be rebooted every 30 days due to Windows Updates. Also the size of the hypervisor is considerably different with ESXi being 32 Meg and Hyper V Server being 1.5 Gig. This will all play a factor in boot up time and how secure the hypervisor is. I think that Microsoft’s Hyper V is a handy tool to help with testing and maybe consolidating a few servers, but it doesn’t have the track record or the features that the free ESXi or Xen Server have. So Microsoft does have a way to go to even come close to Vmware but you can run four virtual instances of Windows Server 2008 Enterprise edition as virtual machines in Hyper V without buying another license. Hyper V is a pretty cool virtualization platform from Microsoft but I don’t think it is the best choice for Enterprise or medium size business level deployment of virtual machines. It may be well suited to small business that has a small IT budget. Buying a Windows 2008 Server x64 Enterprise or Standard Editions and then you will be able to run either 4 virtuals or 1 virtual, depending on the edition, using the same license you purchased. Check it out if you have Windows Server 2008 64 bit, if not you are SOL. But virtualization is cool and you never know when your company may want you to learn Hyper V. For home users don’t was your time and money. Go download a free hypervisor of your choice.